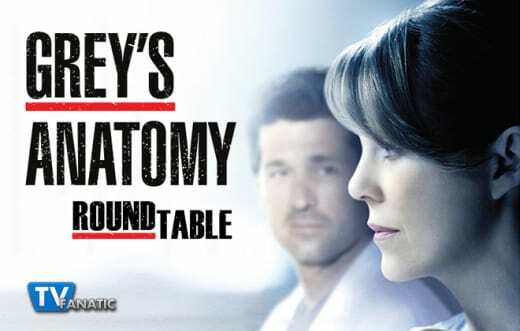 Welcome to another Grey's Anatomy Round Table! We finally found out what happened when Derek was in D.C. on Grey's Anatomy Season 11 Episode 17. The installment provided Stacy Glanzman, Amanda Steinmetz and Christina Tran with plenty to discuss regarding MerDer, Owen, his mother and MUCH more. What was your favorite quote or scene from Grey’s Anatomy Season 11 Episode 17? Stacy: I have to go with Alex hugging Meredith and her initial resistance. I love their relationship and he’s filling the role of her “person” quite well! Amanda: I liked Meredith telling Derek she could live without him, but she didn’t want to. Christina: I’m with Stacy. I loved that moment between Alex and Meredith. It was short but said so much. Derek shared an intimate kiss with his research fellow. He then rushed back to Seattle. React! Stacy: That’s about what I was expecting. I knew if it was truly nothing, he wouldn’t have felt the need to rush back, but I also didn’t necessarily think he full on cheated. He stopped himself before it went further and I definitely believe he was being sincere when he told Meredith he loved her and wanted to make it work, but if he’s not honest with her about the kiss then none of that matters. What he did was wrong, but it’s forgivable if he’s honest about it. Hopefully, he comes clean. Amanda: That’s what I pretty much pictured. I think we all knew something must have happened in order for him to rush back so quickly. Yes she kissed him, but he definitely kissed her back. I’m just glad he stopped himself and realized what was truly important. Christina: I was annoyed. I’ve been a big fan of McDreamy, but I know longer think he’s dreamy in the least bit. He needs to come clean to Meredith ASAP. Predict what happens when Derek returns to the GSMH. Stacy: The previews look like there will be conflict between Derek and Amelia, but hopefully that’s Amelia being paranoid and Derek doesn’t try to steal her job. I wouldn’t it put it past him, but I’m over “jerk Derek” and want him to be “McDreamy” again. Amanda: It looks like he might be butting heads with Amelia. I just hope he doesn’t try to steal the spotlight from her like he did before he left. I want to see them work together without trying to overshadow each other. Christina: Aside from drama with his sister, I also think things also won’t go as smoothly between MerDer at the hospital and at home. I’m curious to see how they both deal with having one another back in their lives. What did you think of Owen’s storyline with his mother? Stacy: I wasn’t really feeling it. Owen had a right to be upset, that’s a huge shock to have thrown at you. I can understand why he would think a guy in his thirties would have ulterior motives to wanting to be with her and I don’t blame him for wanting to protect his mom. Amanda: It was definitely a random storyline, but I like anything when it involves Debra Mooney. Only part that was annoying was Owen’s reaction. I understand he thought he was protecting her, but her reaction to his suspicions was sad. I’m glad the guy truly cared about her and didn’t have an agenda. Christina: I thought it was unrealistic for Owen to come around as fast as he did about his mom’s boyfriend. 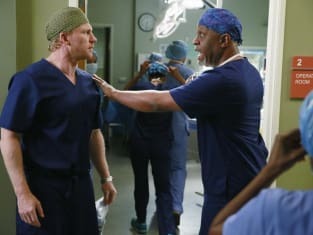 I also felt like Owen’s storyline was random and only given to him to push Omelia together. Stacy: I didn’t really like the Owen’s mom storyline honestly. It didn’t make a lot of sense to me. Amanda: Owen disappointed me throughout the majority of the episode, but he made up for it by the end. 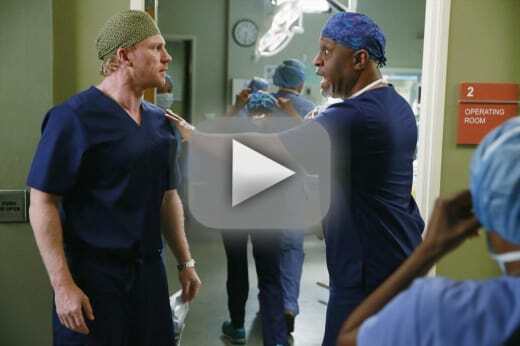 Christina: McDreamy’s omission of what happened in D.C. was really disappointing.